FaceBook Share: User can share their card details of facebook by facebook credential. Linked In: User can share their card on linked in by providing credential. MySpace: User can share their card on my space in by providing credential. 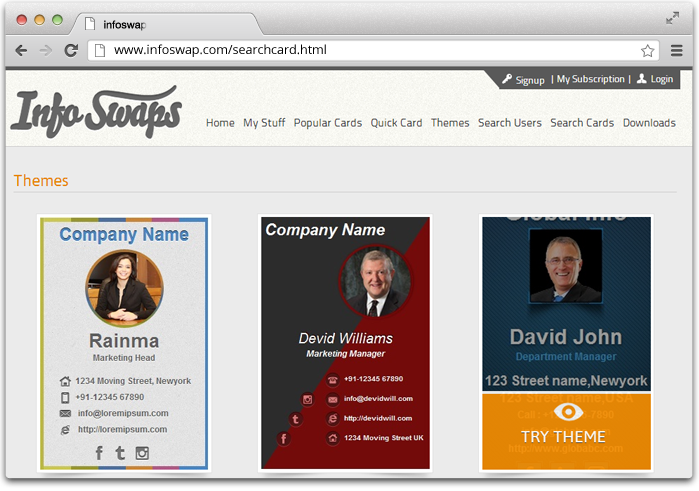 Swap Card: Users can swap cards. Download Contact Details: User can download contact details of this card to their device and can add to their contact list. My Swap Card: This module show card swap details of other user he has exchanged cards with. 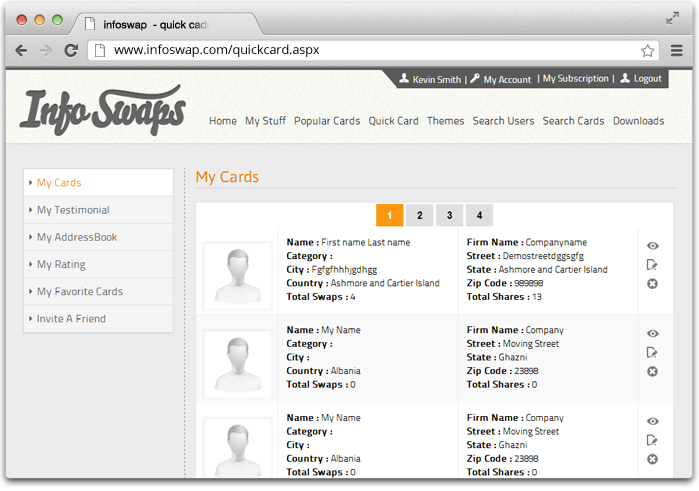 Swap Card Details: User can view their card swap details. 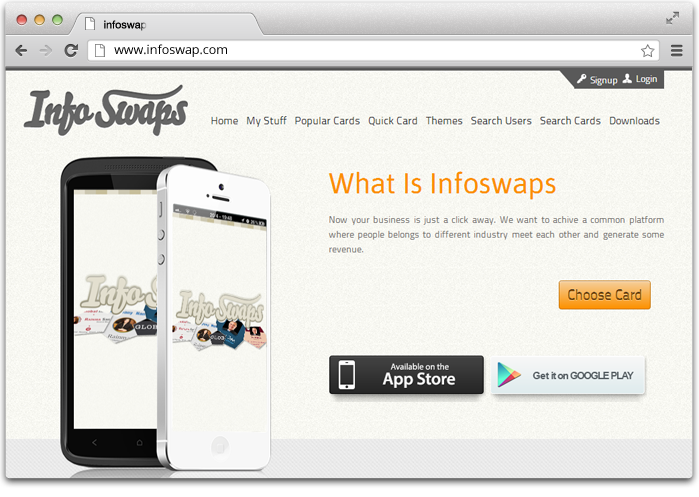 Infoswaps is a useful business app with numerous screens that allow you to do a lot more you think a business app can do. 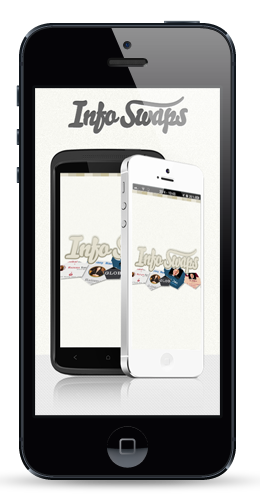 Splash Screen: Splash screen of the application with company logo. Login Screen: User login with the application using this module by providing their email address or user name and password. Forgot Password: User can retrieve their password detail by providing email address or user name. User Registration (Sign up): New user can create a new account using this option. General Details: User registers with application by providing their general details like email address, password and a unique user name. Email to Activate Account: After registering for the application email will be sent to user’s email address to activate their account. Home Screen: This screen contains link of different modules and he can select appropriate module to interact with the application. Set Profile: This screen will display the first time user logs in to application after registration. This module has two screens which are: Basic Information: User can set their basic information like Firm name, First Name, Last Name, Mobile Number, Address details, social Ids (Facebook, twitter, linked In, My Space). Profile Picture: User can upload their profile picture that used during creating card to set their photo on card. List of cards: List of all user created cards. Delete Card: User can delete their card details by clicking on delete card link. Search Card Detail: User can search for card using different searching criteria like by category, Firm name, Email address, Telephone Number, Social Media ids. Result of search card: After searching by different criterion user can view details of search card. Card Details: User can also view card details by clicking on particular card and view details of that card. Share cards: User can share their card with their family, friends and business circle, User can share their card details using different kind like Email: User can mail their card details to other user by providing email address.FaceBook Share: User can share their card details on facebook by using facebook credentials.Twitter share: User can share their card details on twitter by providing twitter credentials.Linked In: User can share their card on linked in by providing credentialsMySpace: User can share their card on my space by providing credentials. Select Category: User has to select a category for which he wants to create a card. Template listing: After selecting category it will display Template that belongs to that category. Select Template: After selecting Template it will fill up all necessary fields to create a card. 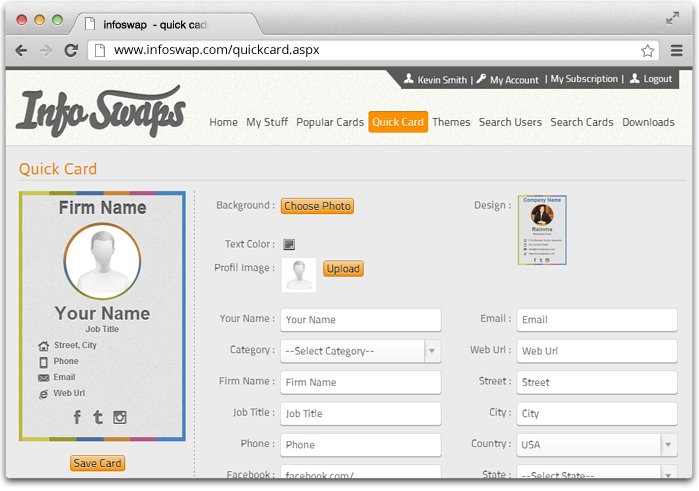 Add Card information: User can add their basic business information to create a new card. Like Firm Name, First Name, Last Name, Mobile Number, Telephone Number, Address. Add Social Media Links: User can add their social media link to card, so that when other user click on that card will redirect to their profile page. Add logo: User can set their business icon on card by selecting image. Add a Photo: User can add their own photo on card using this module. Options: This option is showing logo and photo on card. User can manage to hide and show photo and logo on card using this module. Card Details: User can view card details by clicking on card to view full details of that card. Flip card details: User can flip the card to view user details on flip. This will shows user profile picture and user name. Email: User can mail their card details to other user by providing email address. Card Shared Details: User can view their card shared details also. Like how many times they have shared their card with others and other users have shared their cards. Email: User can view the number of times a card has been shared using email. FaceBook: User can view the number of times a card has been shared using facebook. Twitter: User can view the number of times a card has been shared using twitter. Linked In: User can view number of times a card has been shared using Linked In. My Space: User can view the number of times a card has been share using my space. Update Basic Information: User can update his basic information like firm name, first name, last name, email, address, and other details. 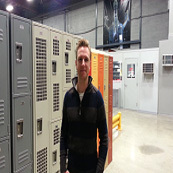 Update Profile Photo: User can update their profile photo by selecting an image file. My Address Book: User can manage his own address book in application. Add Contact: User can add new contact details in application. Upload own background image: User can upload their own background image or as a cover photo. Invite a Friend: User can invite their friends, family or business group to join the application. Rate Users: In this user can rate other users by their cards and business details. Search User: User can search other users by different criteria. Search User: Search user details using different criteria like Email, First name, Zip code, card category. Result of search: This will display users related to search criteria. Rate User: User can rate any user on a scale of 1 to 5 according to their business details and card details. View Cards: This will list popular cards according to the number of swaps. Flip card: User can flip cards to view user information. View Card Details: User can view card details by clicking on that card. Download Contact: User can download card contact information to their device. User Profile: User can view user profile by clicking on user information tab. Rate User: A registered user can rate other user’s profile from this module. Testimonial: User can add review about the application from this module. View Testimonial: Other user can view testimonial details.